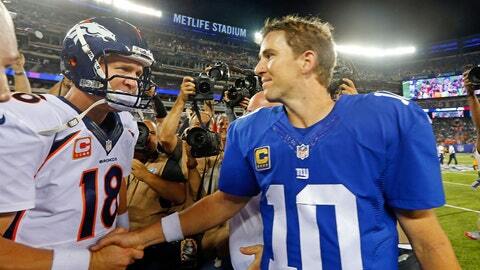 Is Peyton Manning picking Eli's brain? Peyton Manning doesn’t have much experience at MetLife Stadium, playing there for the first time earlier this season. Fortunately, his little brother has plenty of insight to share for Super Bowl Sunday. Manning didn’t have much trouble in his first career trip to the new Meadowlands earlier this season, throwing for 307 yards and two touchdowns in a 41-23 win against Eli Manning and the New York Giants. Now, as Peyton prepares to take that field for the second time, and under much bigger circumstances, his younger brother says he might have some helpful tidbits to share. "I might have a few things for him, but I don’t want to reveal that, because I don’t want to give it to [Seattle Seahawks quarterback] Russell Wilson," Eli Manning said on a conference call Thursday, per ESPN. "So any tips I may have wind-wise, I would tell him in private." MetLife opened in 2010, so no one has a great deal of experience playing inside the stadium, but Eli would know better than any other quarterback in the NFL. Manning has played 33 games, including one playoff game, at MetLife over the last four seasons, going 20-13 on his home field. Manning said MetLife has fewer challenges than the old Meadowlands, where he played the first six seasons of his career. But, like the old stadium, there are still some intricacies. "The old stadium definitely had a specific end zone and corner that you wouldn’t want to throw into if it was going to be a windy night," Eli said. "If it is one of those windy days, then there is a little bit of local knowledge that you can give. But it’s definitely not as bad as the old stadium." Two years ago, when Eli was playing in the Super Bowl in Indianapolis, where Peyton was still a member of the Colts, his older brother lent him advice about playing at Lucas Oil Stadium. This time, he’s just trying to return the favor.